Before you start exporting accounting data you must setup Sales and Expense codes in the Rates section and the clients you will be invoicing in the Companies section. In the Rates section enter a Sales or Expense code for each Rate item. These codes should match the codes used in MYOB. 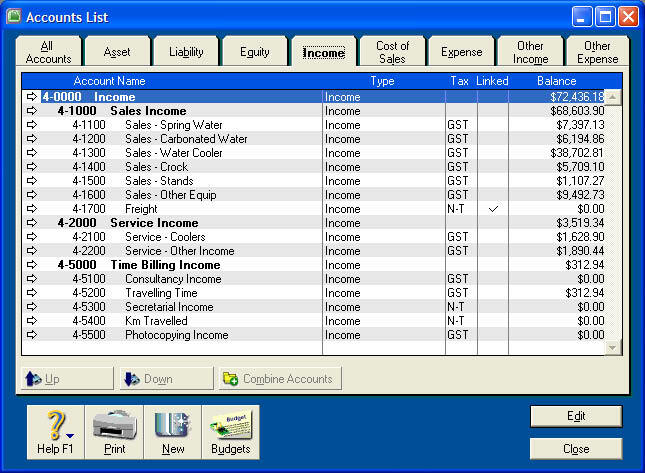 The MYOB Accounts List shows the chart of accounts from which you can obtain the codes. 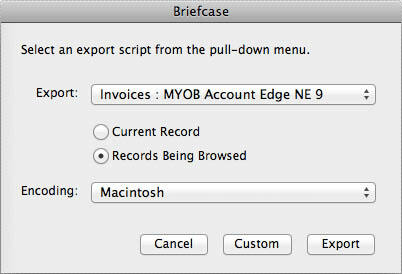 Each Company in Briefcase must have a matching company in MYOB, known as a Card. You can match these records by the Company Name or in some newer versions of MYOB by the Company ID (or Card ID in MYOB). Briefcase has a Company ID field this can be used as the Card ID match field in MYOB. 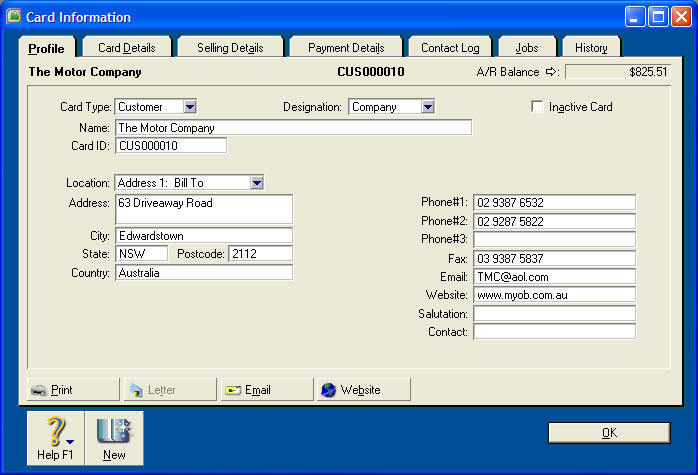 The MYOB Card information window shows both the Name and Card ID for the customer. Select a default export script to match your account- ing package in the Settings section under the Menus tab. There are default scripts for both Purchases and Invoices. 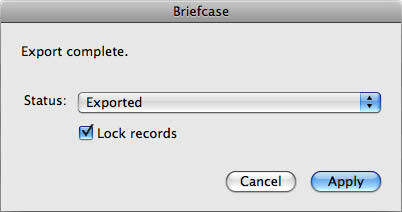 The first step before each export is to find the records you wish to export. This can be done by using the Filter menu (ie. filter open Invoices) or by searching other fields such as date entered. Click the Export button to export the current found records. The Export dialogue will select the default script defined in the Settings Window. You can change these defaults before clicking Export. After the export, the following dialogue will appear. At this point you can change the status of the records to Exported and Lock them to prevent any further changes to the records. 1. Start MYOB and open your company file. Locate the export file and click Open. In the Import File window ensure the Import File Format is ‘Tab-delimited’ and the First Record is ‘Data Record’. Identify Customers should be by Co./Last Name unless you are using Card IDs to match the Companies. The Import Data window must match the Import Fields to the MYOB Fields. Click Match All, this will automatically match the Import Fields on the left with the MYOB Fields on the right. The first time you Match All it is important to scan down the Matching Import Field list to check that each import field is in the right place. Click Import to continue. Errors during import can be common but usually do not result in any skipped records. You can check the MYOB Log file if you have any concerns. Always check the imported records and totals.